We will create a basement design to your unique specifications and walk you through every stage of your remodel, including design, construction, and every phase of the project. Finishing your basement can give you the additional living space that you and your family are looking for in your home. A finished basement adds a beautiful new living area to your home and is the most cost effective addition you will ever get. Remodeling or finishing your basement can be accomplished with ease and without worry when you employ Bell Construction to complete your basement desires. 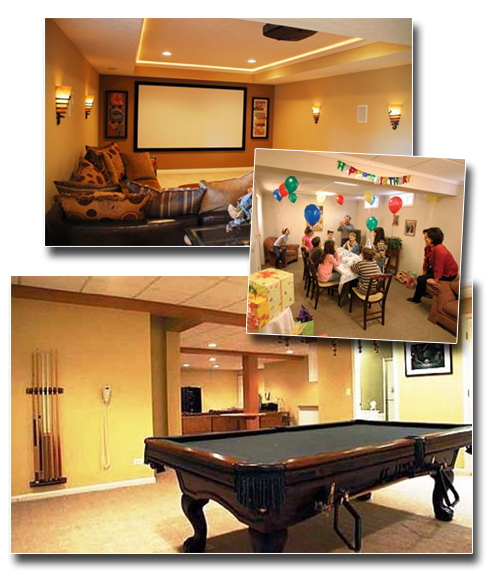 A properly finished basement can be used for just about anything such as a home theatre, a new home office, a game or play room for the kids or just a place where you can hang out with friends and family. Bell Construction services all of N.E. Ohio including all of Canton and Akron. Call Bell today to speak with a professional that can help you with all the decisions involved with a compete basement remodeling project.